Title: BNSF 8080 GE Data Plate. Title: BNSF 8080 passes under the 26th/Goddard Street Bridge that crosses the BNSF Argentine Yard as the Setting Sun Reflects off Her Brand New BNSF Swoosh Logo Paint!!! Title: BNSF 8080 with the Sun Reflecting of Her Swoosh Logo reverse's course and heads back into the ready track lines. Description: Fresh Out of GE Fort Worth, Texas!!! 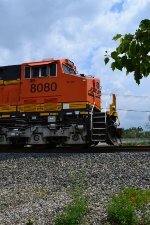 Title: BNSF 8080 and a New Crew pick Her Up to take Her to the Ready line near the base of the short tower located near Main Track 3 on the Transcon. Description: Close Up Shot of BNSF 8080 as they take Her out to the short tower. Title: BNSF 8080 heads down Main Track #3 on Her way to be a add on Locomotive to a east or west Z or Stack Train. Description: Heading to the short Tower at BNSF Argentine Yard on the south side of the Yard. Title: BNSF 8080 is now on Main Track #3 heading west to the short tower as the Sun Reflects off Her BNSF Swoosh Logo on the cab door!!! Description: Another Beautiful Evening is almost at its End as it Shines on BNSF 8080. Description: Sitting in the noonday sun waiting for the green at CP Scioto in downtown Columbus. All by itself...for the moment. Description: This unit looked to be fresh from the factory. Description: My favorite shot in the sequence. Description: Waiting its turn to proceed. Title: BNSF waits its turn to go through CP Scioto at Columbus. Description: Empty grain train X-PTNBTR9. Title: Idiot running in front of a train! Description: As a BNSF baretable gets a green signal and starts taking off, this idiot cyclists decides to not wait and darts across the gates. 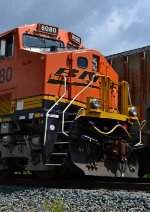 Description: Locomotives in a wide variety of BNSF paint schemes in a yard in Springfield, MO. Description: BNSF 8080 and BNSF 2752 as seen after stepping down the platform a dozen or two yards and looking back shows how after just five power units, things start to disappear into the freezing fog. What I cant figure out is how the wind can be howling through the area *with* fog - I thought they were supposed to be mutually exclusive. Description: This was an Autorack i saw going through Santa Fe Junction from the WWI Museum Tower in KC. Description: Three C4s struggle upgrade with a heavy westbound stack train. The rear of the train can be seen at right. The center axle lifting pistons on these units were clearly deployed, accompanied by plenty of wheel slip. Description: BNSF 8080 screams west in the lead of a hot Z train on the BNSF Marceline Sub. at Bucklin, Mo. Currently passing under the iconic ATSF signal bridge that still stands near town.